I am trying to identify some rocks I recently found in an old river bed in Pennsylvania. The river bed just dried up a few months after a storm caused a fork in it to be naturally dammed up. 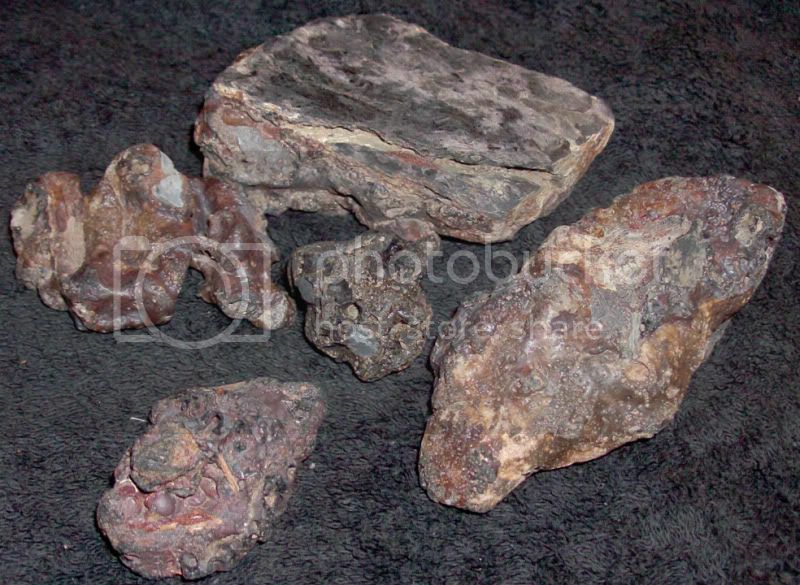 In the bed are a ton of very large pieces schist some with quite a lot of small almandine garnets. The rocks I am trying to identify are very light and pours, they are well tumbled by the river, they, along with most of the rocks have been there for a very long time. 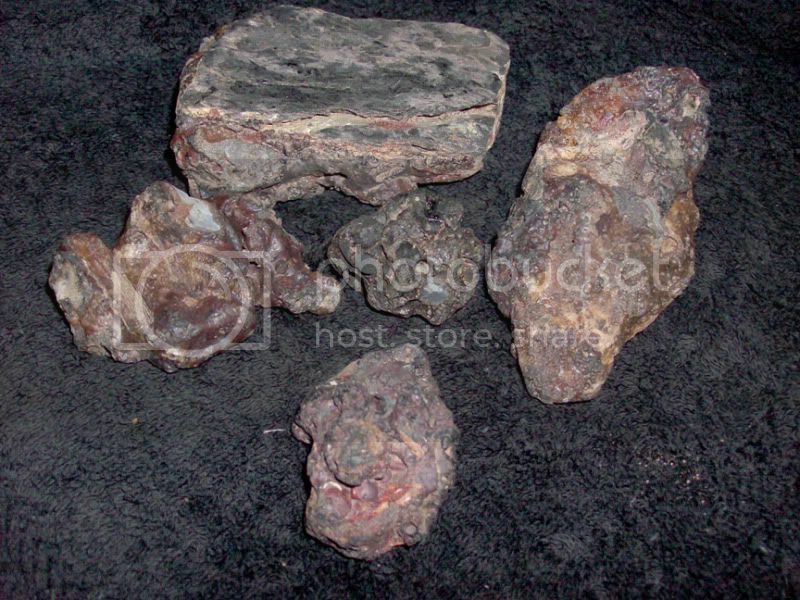 The rocks are grey-black with reds, yellows and browns and are mostly dull but the denser parts are bumpy and every so slightly glossy. They sound almost like glass when tapped. 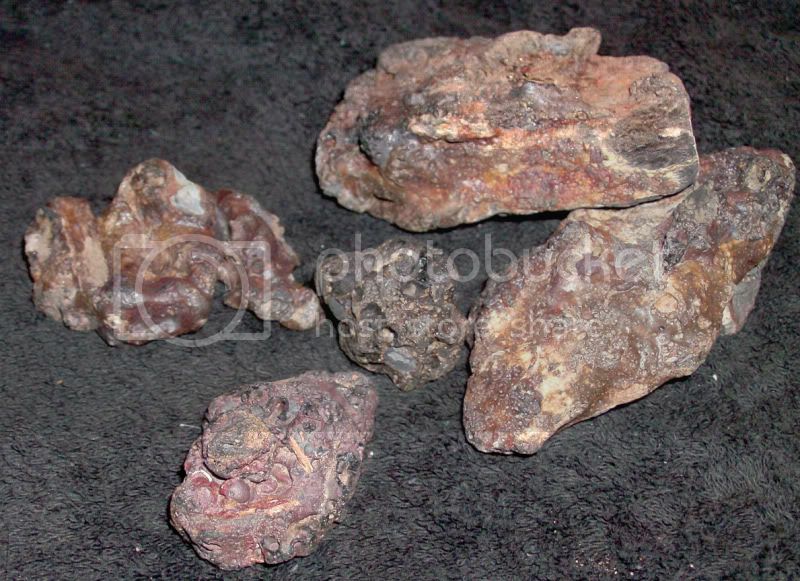 I am thinking they are an iron oxide type, possibly limonite. I have included a few photos of some of the pieces, can anyone tell me what they are? Some of them look like slag, which is a product of mining operations. That could explain the glassy sound when tapped. Can you do a hardness test - that could help further identification. That would explain the fact that first I was thinking they were volcanic debris but the colouring and texture didn't quite add up for that and the river they were found in used to run from many mills. All the ones I know of in the area were paper mills but there were steel mills around the Philadelphia area and the river is huge it could have picked anything up from anywhere around here. And, no I can't test for hardness. Best I can do is hit it with random things and say it's stronger then each thing I hit it with, sadly I'm only partially joking. But I didn't even think about slag, that would explain the free form lava sort of form, the bubbles, the sound and if it were from molten iron then that would be the very irony colouring. I could take more photos if that would help at all but slag does seem to fit! I just thought it looked neat when I was getting the garnets. I know the garnets aren't worth anything I just find novelty in natural formations of rocks and minerals. Thank you!